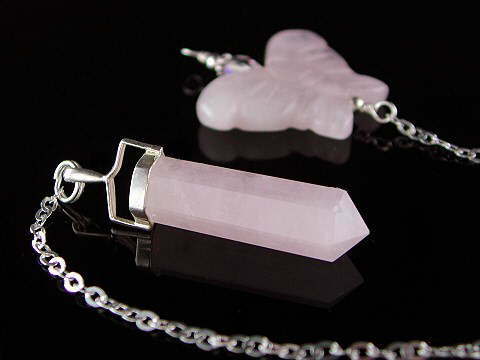 Beautiful Rose Quartz generator (six-sided) crystal pendulum set in a 925 sterling silver collar, finished with a lovely and unusual hand carved Rose Quartz butterfly 'topper'. This is THE stone of self- and unconditional love. Most of us know about the properties of Rose Quartz. It is often one of the first crystals we work with or come into contact with. Commercially it is almost always marketed as a Love Stone, which indeed it is, and has been regarded so for thousands of years with its beautiful, sweet energy, but it there is also a deeper side and purpose to this much loved, but often overlooked pink stone. If you want to read more about Rose Quartz and its crystal 'mission', visit the A to Z section of this web site and look up its deeper meaning. Butterflies represent transformation, movement, freedom and beauty.